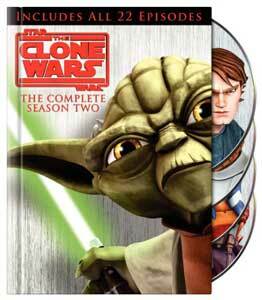 Star Wars: The Clone Wars: The Complete Season Two is being released on Blu-ray and DVD on November 10. All up there are 22 episodes on the discs, with the stories and action set in the period between the Star Wars Episode II: Attack of the Clones and Star Wars Episode III: Revenge of the Sith movies. The Jedi Temple Archives: special effects footage, early concept art, 3-D character and object turnarounds and early animation. Behind-the-scenes featurettes on each disc: ‘Attack of the Zillo Beast’, ‘Magic of the Holocron’, ‘Return to Geonosis’, ‘Creating Mandalore’. Star Wars: The Clone Wars The Complete Season Two will sell for $69.95 RRP on Blu-ray, and $59.95 RRP on DVD. JB HiFi will sell an exclusive DVD bonus disc version for $64.95 RRP.